let us do the same for your operations! ​FastCharge Australia through its affiliation with Posicharge is committed to continually improve, enhance, and release new intelligent energy management products for the material handling market. PosiCharge parent company AeroVironment has been developing breakthrough power electronics and battery management technologies for over 30 years. 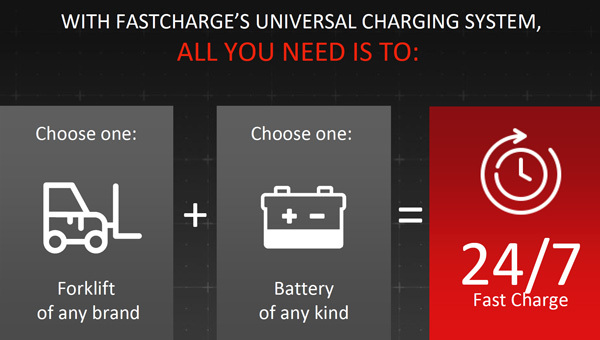 PosiCharge systems – the most advanced line of fast chargers available today, is a product of this rich heritage. 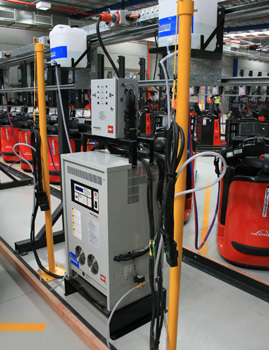 When the AV Inc engineers developed the premiere fast charge system for electric cars, effectively reducing charge times by a factor of 12, they applied this revolutionary innovation to the world of material handling. They discovered that by applying PosiCharge to industrial applications, they could save material handlers millions of dollars annually by eliminating battery-changing operations. Moreover, PosiCharge makes the conversion from internal combustion to electric vehicles more affordable for operations executives and managers. Entire fleets of industrial electric vehicles that move, store, and make product for Fortune 500 companies are powered by PosiCharge, every single day. PosiCharge outdoor ground support fast chargers are durable and well suited for light or heavy duty airport GSE applications. Flexible installation options minimize infrastructure & installation costs. PosiNet Systems and Battery Rx are software tools designed to manage your fleet's batteries effectively, minimize downtime, provide valuable insights and optimize vehicle battery charging within and across facilities. Our unique cable and battery management accessories give you the ability to take your charger's performance and safety to the next level, with the confidence that comes with the PosiCharge reputation. The key to operating all day on one battery is our peerless three-pronged technology that minimizes time, maximizes battery life, and enhances fleet management. 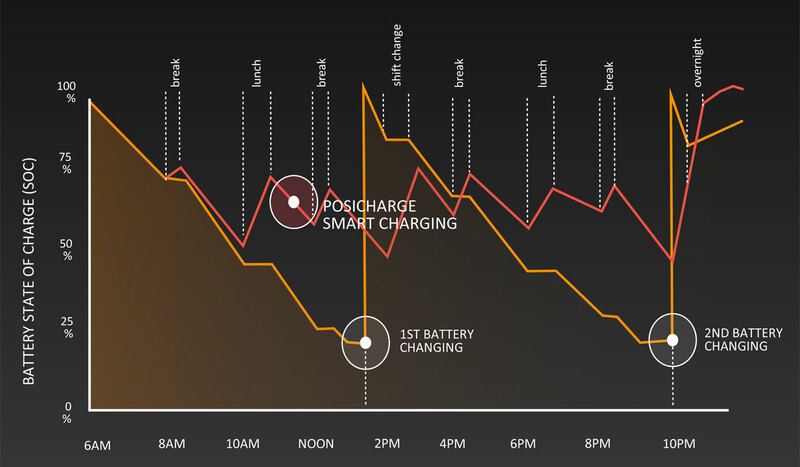 Power Distribution Technology delivers short, precise, high-power charges to the battery while in the vehicle. This allows vehicle operators to charge batteries in the truck and during breaks, lunches, and shift changes - completely eliminating the need for battery changing. This concept has enabled us to minimise risk of injury due to not needing to change battery's and also has increased efficiencies which is obviously vital in the current economic climate. I didn't want the cost, lost productivity and injury risks associated with changing batteries to impact our business. Posicharge gave me the solution I had been searching for. Self watering system means no more forgetting to fill up the batteries, this has resulted in excellent life span of our batteries. Excellent charge rate, auto equalising function is easy to use and ensures life of batteries are maintained. © Copyright 2017 Fastchargeaust All rights reserved.